In a fun move, cast members from ABC Family's Baby Daddy and ABC's General Hospital will crossover on both shows this February. On Wednesday, February 4, General Hospital's Kelly Monaco (Sam McCall) will guest star on Baby Daddy. Then on Friday, February 13, Baby Daddy's Derek Theler (Danny Wheeler) and Melissa Peterman (Bonnie Wheeler) will guest star on General Hospital for a special Valentine's Day episode. In "Over My Dead Bonnie," Kelly Monaco plays an exaggerated version of herself. Danny is offered a cameo role on General Hospital; he's really nervous and asks Riley to help him rehearse. Riley is a huge fan and can't believe Danny is going to be in a scene with Kelly Monaco (Kelly Monaco), who plays her favorite character, Sam. Although Kelly is initially annoyed by the stunt casting, she soon finds Danny charming and decides he needs to be her new love interest. Meanwhile, Tucker and Ben are tired of living with Bonnie and are determined to get her out of their apartment and back into hers. The boys figure out the best way to break the lease is to have Bonnie "die," so they stage a funeral on the General Hospital set. This episode of Baby Daddy airs Wednesday, February 4 at 8:30pm ET/PT on ABC Family. 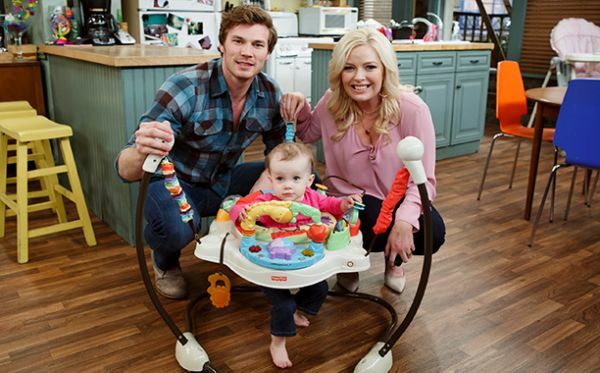 On General Hospital, Melissa Peterman plays an old friend of Olivia's from Bensonhurst, and Derek Theler plays a colleague of Dr. Patrick Drake. In this episode, it is Valentine's Day in Port Charles. Olivia receives a surprise visitor from her Bensonhurst days. Melissa Santoro-Picard (Melissa Peterman) and the two old friends quickly catch up on life and loves. Later in the day, Melissa runs into another familiar face in Port Charles. Meanwhile, Dr. Patrick Drake is called to consult on a case at the last minute, delaying his date with Sam. Coincidentally, Patrick's colleague Derek (Derek Theler) was also stood up by his date. Derek and Sam agree to keep each other company until their significant others arrive. As the night progresses, the two discover the true meaning of Valentine's Day. This episode of General Hospital airs Friday, February 13 on ABC daytime. The Paley Center for Media announced the lineup of honorees for its 32nd Annual PaleyFest, which returns to the Dolby Theatre at Hollywood & Highland, March 6-15, 2015. The William S. Paley Television Festival will welcome Showtime's Homeland, HBO's Girls, The CW/CBS Television Studios/Warner Bros. Television's Jane The Virgin, FOX's Glee, ABC'S Modern Family, STARZ's Outlander, MTV's Teen Wolf, and FX's American Horror Story: Freak Show to the lineup of previously announced honorees: ABC's Scandal, CBS Television Studios' The Good Wife, and The CW/Warner Bros. Television's Arrow and The Flash. Comedy Central's Key & Peele, BroadCity, Kroll Show, and Workaholics will be honored with a special salute to the network. Yahoo Screen will exclusively live stream the interactive panel sessions in addition to offering video on demand (VOD) content following each event. Live streaming on Yahoo can also be accessed through the Paley App and Yahoo Screen App.